On the day of our Iron Chef challenge, Snotty McSnobster arrived at my fifth-floor walkup, toting an uncharacteristic burlap sack like a sort of twisted Santa Claus. First he pulled out a bottle of Plymouth, then a pack of limes. I queried the Snobster, “That’s it? We’re drinking pure alcohol? Are you trying to get me drunk so I mess this up?” He poured two of his deadly gin gimlets, we clinked glasses, and his only response was a raised eyebrow. I couldn’t contain my anticipation any longer. “Alright already, show me what you got!” Snotty grabbed the sack, and with a flourish, though not quite a karate chop, spread its contents onto my kitchen counter. Fiddleheads! Impressive. Tricky. Taxing to clean and tough to imagine making for dessert. 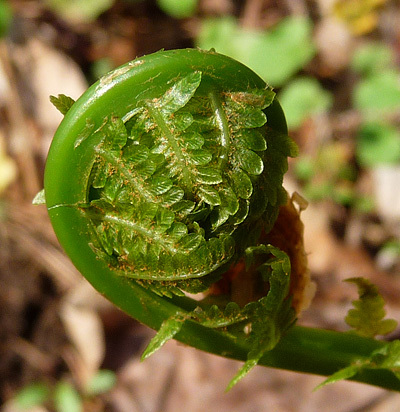 These young ferns, named because they resemble the scroll-like ornamentation at the end of a fiddle, have a short season and a cultish following for the few weeks they flaunt the farmers’ market every spring. “You’re happy? I think you’re screwed,” Snotty spewed. I curled up on my couch, gimlet at the ready, and began to sketch out the evening’s game plan. Menu in hand, I told Taleggio to keep an eye on Snotty and left the boys alone in my apartment. I was a woman on a mission when I reached Union Square; I would utilize the market as much as possible, and then I’d turn south to Whole Foods when in need of greater market variety. Knowing that Snotty would be unable to resist our shared favorite food, I stocked up on cheese first: from the farmers’ market, a hand-churned fresh ricotta and an aged sheep’s milk pecorino; from the supermarket, a ball of can’t-beat-it burrata. Oodles of produce, araucana chicken and duck eggs followed, along with fingerling potatoes in every color, wildflower honey, sweet cream butter, smoked salmon and handfuls of fresh herbs. Walking home, I began to think through the logistics of this meal. I knew I wanted to make some kind of fiddlehead frittata and that that dish should be à la minute, or made to order, so that it could be served steaming hot. A fiddlehead quick bread modeled after my banana walnut loaf and sweetened with wild flower honey-butter should get into the oven first. The rest of my dishes, I told myself, would fall into place. Snotty helped me unload my bags, and I got to work cleaning the fiddleheads, carefully wiping away any soil that was caught between the curly ferns, then giving them a good soak before setting them on paper towels to dry. I set up an impromptu steamer (a.k.a. a lidded mesh strainer set over a pot of boiling water) and put a few sauté pans on the stove to handle the ferns that would succumb to their stir-fry fate. First I made the batter for the quick bread, roughly chopping some steamed fiddleheads (and reserving others whole to garnish the top) while toasting walnuts and shredding zucchini. I added some dried apricots for sweetness, and mixed the honey with the butter and a little more than a dash of the fleur de sel Erin brought me back from Paris. Then I set a pot of salted water to boil in preparation for a springtime pasta verde made with orecchiette pasta and a fresh pesto of garden basil, mint and ramps. 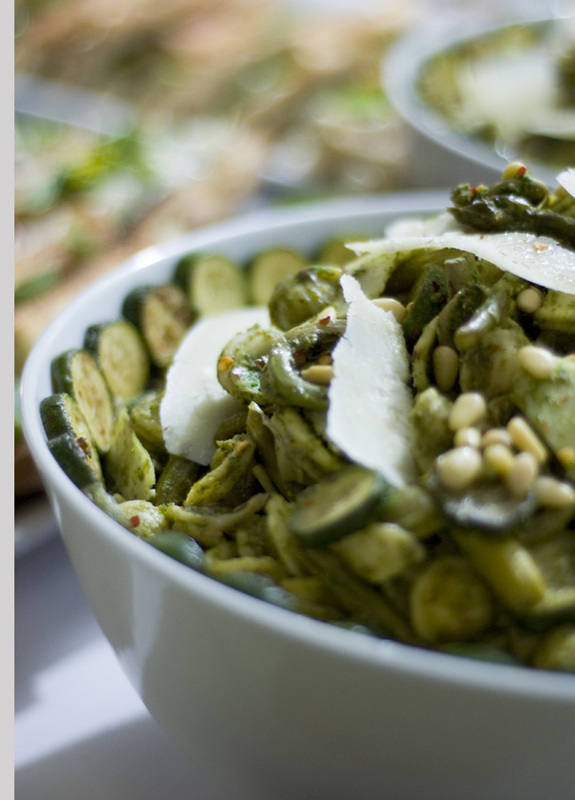 A heavy dose of pecorino and a half-cup of pine nuts completed this fragrant mess of green. I sliced up more zucchini into thin coins, quartered artichoke hearts and chopped bite-size spears of asparagus, sautéing each vegetable individually in its own mix of lemon, chilies and olive oil, before adding them to the warm pasta. This pasta salad is a dish best served at room temperature, so I left everything to cool together while I continued on with my cooking. Next up, I set about making my frittata filling. Ricotta, araucana eggs, and grass-fed whole cow’s milk formed a thick base to which I added the fiddleheads, boatloads of dill, spring peas, spring onions and smoked salmon. With smoky and sweet smells soon emanating from my oven, I knew I was on the right track with Snotty’s challenge. 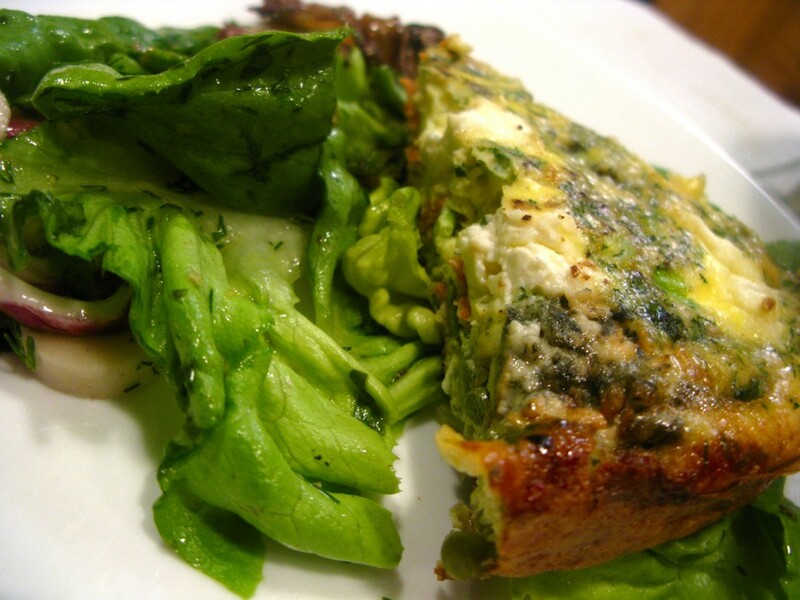 A quick butter lettuce and basil salad would garnish our frittata plates and round out the dense egg dish with a spike of fresh citrus vinaigrette. With the frittata and bread baking away, the pasta cooling on my counter, I sautéed the remaining fiddleheads in garlic butter, half of which would soon make their way atop a pile of fingerling French fries. After soft-boiling the duck eggs, I cracked open their tops, sprinkled them with a few grinds of the peppermill and plated the sautéed fiddlehead “soldiers” beside them to dip in the sloppy mess. And finally, as it so often is with cooking, I began to prepare last what was meant to be eaten first: bruschetta with garlicky fiddleheads, balsamic so aged it pours like maple syrup, thick slices of burrata cheese, and more of Erin’s prized salt bounty. At this point, the Snobster snuck into the kitchen to spy on my progress. As we sat down to enjoy the rest of our meal, I realized that the best bet is a food world where the local and the imported join forks. To read Part I of my adventures in Iron Chef: Fiddleheads click here. No wine or beer pairings? It does seem yummy. 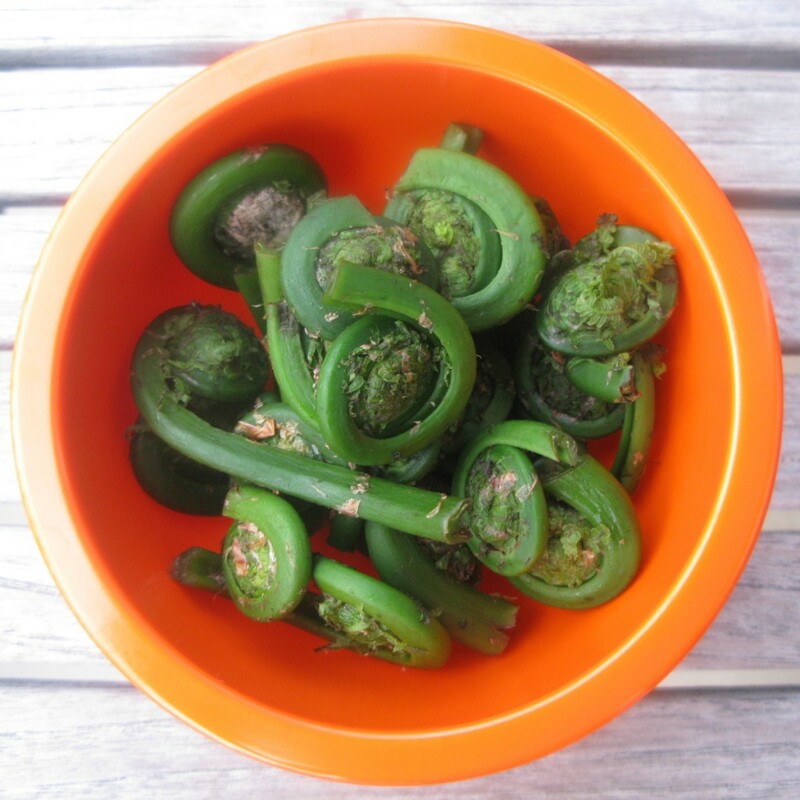 What did the fiddlehead taste like? Great question! Duh! Why didn’t I describe the taste? And I call myself a food writer!!! Fiddleheads taste like a cross between asparagus, spring onion and artichokes…everything that’s ripe and irresistible this season! yes, i was wondering that too — they sound delish!